b.kyokushin.ca/events/montreal_2012/poster_sm.jpg" />The following members attended the recently held 24th Fighting Spirit Championships in Montreal. The 24th Canadian Fighting Spirit Championships was held at the College Notre Dame in Montreal and we had a special guest , former Kyokushin World Champion and K-1 Kickboxing Star Shihan Francisco Filho. With 1200 people in attendance, I was happy to see some great people from Montreal who strive to make Canadian Kyokushin Karate the best it can be and to contribute to the growth of the IKO Kyokushinkaikan. I was fortunate to meet the attendees including: Shihan Andre Gilbert, Shihan Renald Lamarre , Shihan Pierre Cataford, Shihan Allain Bonnamie, Sensei Lino Gambuto, Sensei Sylvie Lamarre and Sensei Sylvain Lemire. And it was also great to see my teammates whom I have been proud to be on the North American team with at those World Tournaments that I fought in 2003, 2005, 2006 and 2007. Sensei Tats Nakamura from Vancouver, who is my former Karate teacher from 2001 to 2008 , participated in this event as well. I was his apprentice and fighter for all those years and owe much of stuff I know about Karate to him. Since I moved to my home province of New Brunswick in 2008, I have established my own dojos at five different locations, which follow the training style of Vancouver Kyokushin Karate. It is always a great joy to see him and his team at a special event such as this. We had planed for a couple of months to meet and participate in this high caliber tournament. Sensei Tats brought Mark Berg from his dojo. The World Tournament contender, Mark placed 1st at the Vancouver Cup 2011 last December. He was aiming for a title shot of the Super Heavyweight division at this event. And I brought the New Brunswick Kyokushin Challenge lightweight champion, Chrysat Allogho. There were over 100 competitors and some were world class fighters. For the last few months I had been preparing Chrysat for this competition. The preparation included, according to him, the hardest training camp he has had in his life. Chrysat started martial arts at 5 years old in his native country of Gabon in Africa. He is now a university student at the Universite de Moncton and has trained at our dojo for one year. When Chrysat first joined me he had great talent with lightning fast kicks. His weaknesses were defense and punching techniques. We have worked so hard for 1 year together and now he is a complete Kyokushin fighter. On the day of the tournament, Sensei Tats appointed me to coach Mark Berg as he was occupied as one of the main judges in the event. I truly did my best to prepare Mark Berg and Chrysat before their matches with proper warm ups and strategic advice. The first fight would be Chysat vs Edgardo Paz Briceno. Edgardo was from the famous Lamarre Dojo and I knew it would be a tough challenge. In the first round it was truly a close fight with nonstop action, the crowd was excited and it was a draw at the end of the round. The extension round was no different and only in the last 20 seconds Edgardo started to feel the effects of Chrysat's upper cuts and right low kicks and was not able to regain his energy in time to win the round which was awarded to Chrysat. This was truly the hardest fight he had throughout the day. He was so exhausted as he gave 100% of himself. Now fully recovered, Chrysat moved to the second round where he would face Shihan Andre's fighter, Stephen Taylor. For this match Chrysat had a extra encouragement on him. Sensei Nakamura had some free time from officiating and sat next to me as coach for Chrysat. Chrysat seemed more relaxed during the fight and landed a beautiful ushiro mawashi geri (spinning heel kick) to the head which clearly landed and scored a wazari (half point). The score resulted in the win of the fight. The next fight I had to coach would be Mark Berg's first fight against Sebastien Vallee from Chateauguay Dojo. During this round Mark seemed a bit slower and less intense than usual but the powerful heavy weight did enough to secure the win. Sensei Tats was not quite happy with Mark's speed during the match so my only advice passed onto the Vancouver fighter for the next match was to kick less but when he would kick to set them up with punches and lots of speed. Now that the semi finals were done we had a big job to do in the finals which both fighters had made it to. First to go was the final lightweight match which was Chrysat's last fight and biggest challenge of the day against top North American fighter and champion Julien Marquette from Boucherville's Shihan Cataford dojo. The fight was one of the most exciting of the day with crushing blows traded Julien's superior punching power were awesome and on the other hand Chrysat displayed a rampage of lighting fast acrobatic kicks which made the crowd scream wow during the tough fight. The judging this day was truly impressive and fair, the decision was a draw and Julien and Chrysat prepared for a extension round , the battle was ongoing just like the first round but near the last minute Julien landed heavy punches which slowed down Chrysat enough that he felt desperate to land a knock-out with high rolling kicks. Julien Marquette deserve to win as the judges decision was final. This was Chrysat Allogho's 2nd real Kyokushin tournament and a 2nd place finish made all of the New Brunswick team very proud ! The last task of the day for me was to help coach Mark Berg beside Sensei Tats. Mark was to face David Labreque from Laval. David fought very well at his previous round that I felt worried Mark would have a hard time beating the black belt in the finals. To my surprise Mark Berg just came out more relaxed in the final bout of the day and displayed strong punches and fast low kicks which landed at will. David was a bit outclassed by Mark's power and was unable to give Mark enough damage to pull a win. Mark Berg easily won the fight to prove that he was indeed the 24th Kyokushinkai Fighting Spirit Super Heavyweight Champion. All in all, it was a great experience for me and Chrysat to work together with Sensei Tats and Mark. The matches that Chrysat fought gave him tremendous confidence and experience as well. 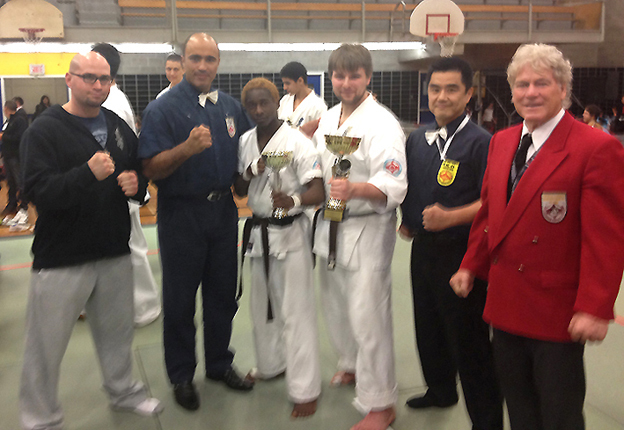 I would like to thank Shihan Andre and his team of the Montreal dojo for hosting such a great tournament. Special thanks goes to Shihan Francisco Filho for travelling all the way from Brazil. It was great honor for all the fighters to compete in from of the World Champion. Finally, I would like to thank IKOK-C for giving us access to the tournament. Osu. This entry was posted	on Sunday, April 1st, 2012 at 5:55 am	and is filed under Uncategorized. You can follow any responses to this entry through the RSS 2.0 feed. Both comments and pings are currently closed.